"In 2014, the total gross domestic product of BRICS countries reached 30 percent [of the world’s GDP – Ed.]. This is less than that of the G7, but the difference is seven or eight percent. The combined GDP of the BRICS countries, according to the International Monetary Fund is $32.5 trillion[by purchasing power parity - Ed. ]; the G7’s is $34.7 trillion. 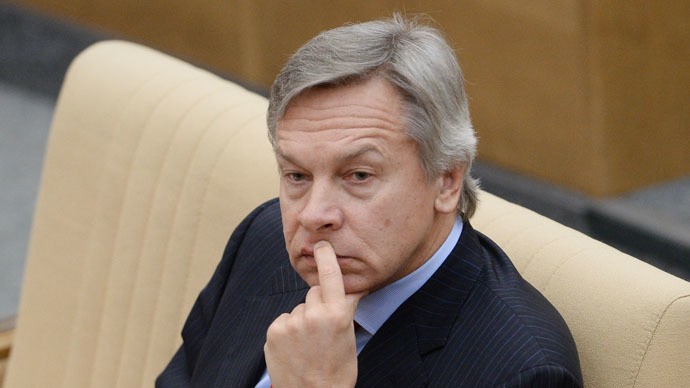 Given that the BRICS members mostly show much higher growth rates than the G7, we can assume that in the next two or three years the aggregate GDP of the BRICS countries will exceed the G7’s,”said the head of the State Duma Foreign Relations Committee, Aleksey Pushkov, speaking to reporters at the first BRICS Parliamentary Forum in Moscow. Pushkov’s comments were made as G7 leaders were meeting in Kruen in the Bavarian Alps. Russia was expelled from the group last year over reunification with Crimea. Russia expects to launch the bank as well as a currency reserve pool worth another $100 billion at the July BRICS summit in Ufa, said Russian President Vladimir Putin.Among other projects is a special business travel card which willsimplifyvisa procedures and boost business between members. BRICS account for more than 40 percent of the world's population and about 30 percent of the world’s GDP.